China’s Wang Hao won the $15,000 first prize for the inaugural Sharjah Masters despite ending up in a 6-way tie for first. The key game was a win over India’s Adhiban, who had to settle for second place. Many of the players have now made the short trip to neighbouring Dubai for the 19th Dubai Open, which started with a bang as top seed Anton Korobov and local star Saleh Salem both lost to players they outrated by almost 500 points. It’s always something of an anti-climax when a big open ends in a big tie, but Wang Hao will have no complaints, since prizes weren’t shared and the 27-year-old finished top of the leading group! His key victory came in Round 7, when he beat and leapfrogged over joint leader Adhiban. The Indian’s sacrificial attack had already run out of steam, but that was no reason to fall for one of the oldest tricks in the book when he played 28.N4c3?? 28…Nxc5! picked up another pawn and, just as crucially, left White’s queenside in tatters. White was soon three pawns down for no compensation and although the game went on to move 55 it could have ended much sooner. That was the only game Wang Hao won in his last five games, but he’d done enough with his 4/4 start to end on 7/9. The only player who came close to taking away first place was Ukraine’s Martyn Kravtsiv, who ended with three draws but had real chances to reach 7.5/9 by beating Arkadij Naiditsch in the final round. Kravtsiv had Black, but Naiditsch was in the mood to gamble, spending almost half an hour on 13.Ng5!? That was a pawn sacrifice, though after 13…Bxe5 14.dxe5 Martyn didn’t play 14…Qxe5 but instead gave Arkadij the chaos he was looking for after 14…Nf4 15.Nf3 Nxe5 16.Qa4! (hitting the undefended e8-rook) 16…Nxg2+. That set the scene for a murky encounter that could have finished with any of three results but eventually ended on move 67 with Kravtsiv left with King + Bishop against his opponent’s bare king. Among the players who reached 7/9 local United Arab Emirates Grandmaster Saleh Salem stood out for his Swiss gambit of starting with a loss, then two draws in his next three games and only then winning his remaining five games! That’s as good a moment as any to switch to the neighbouring emirate, as you'll see. That was the first big open tournament in Sharjah, but it was following the tradition of the other Emirates such as Abu Dhabi and, especially, Dubai, which this year is celebrating the 19th edition of the Dubai Open. It’s just a short journey from one Chess and Cultural Club to the next! The 9-round format is the same, with a slightly lower prize fund: $13,000 for first instead of $15,000 and $50,000 instead of $60,000 overall, though it should be added that the separate Dubai Blitz Championship also has a $4,000 prize fund. 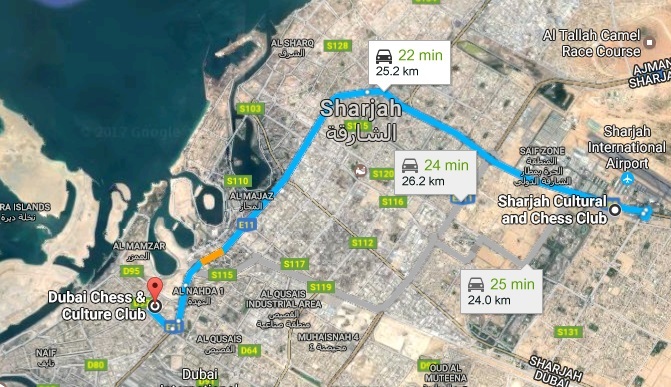 Many players have decided to combine the Sharjah Masters and Dubai Open, including the reigning Dubai Open and Blitz Champion Gawain Jones and the likes of Areshchenko, Safarli, Anton, Iturrizaga, Sargissian, Mareco and some prodigies such as 11-year-old Praggnanandhaa. The top seed is Anton Korobov, who got off to the worst possible start! After getting into trouble in a Sicilian he poured more oil onto the fire with the pawn grab 17…Bxh4? 2211-rated Vusal Abbasov from Azerbaijan didn’t need to be asked twice and crashed through with 18.Bxh6! Try as he might, Korobov couldn’t avoid the logical outcome of the game. He wasn’t alone, though. 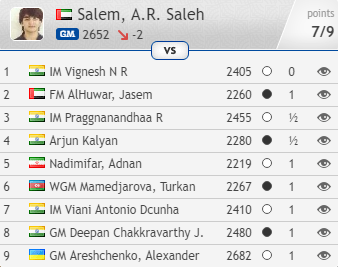 Saleh Salem did the same as he did in Sharjah and started with a loss! Playing Black he pushed pawns on both sides of the board and only ended up losing them, before his attempts to find counterplay led to disaster. His opponent, 2149-rated Pranav, is one of 91 (!) Indian players in the 214-player event.